Judges, who would like to take part at the judging seminar on May 17, 2019 in Berlin, must send their application on this email: dankezu@gmx.de with the headline – “Judging Seminar”. In the case of successful passing of the seminar and the exam, the participants of this seminar have a chance to be chosen as official judges for the 2nd Youth KWU Kyokushin European Championship in Berlin 2019. Candidates for judging will pay all their expenses themsleves. 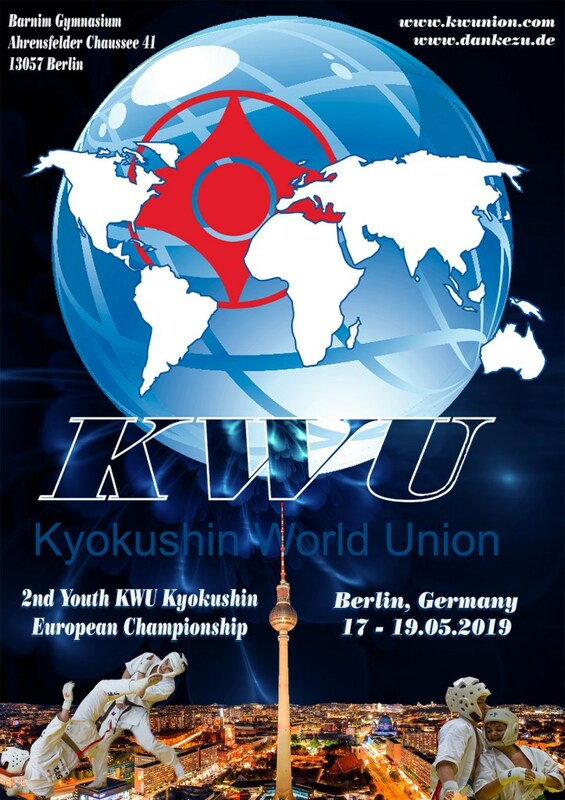 Start fee: 30 € for each fighter (the starting contribution includes a gift package to the participant, a lunch package in the days of a tournament, accommodation of official judges in days of holding of the 2nd Youth KWU Kyokushin European Championship). gum shield (oral cavity protector), white color – voluntary. – transfer for accredited judges: hotel – arena – hotel on the days of the championship. Accredited judges and competitors on their own will cover all the other expenses. The organizer will not cover any expenses of other groups of participants of this tournament. 10:00 – Arrival in the sports hall of competitions, preparation. 10:30 – the Meeting of coaches and judges. 11:00 – the beginning of preliminary fight. 14:00 – lunch break, demonstration performances. 11:00 – beginning of semifinals on all three Tatamis. 14:00 – lunch breaks, demonstration performances. 17:00 – Awarding of the winners, a photo shooting. Departure of the teams from their Hotel. Applications are accepted by e-mail.